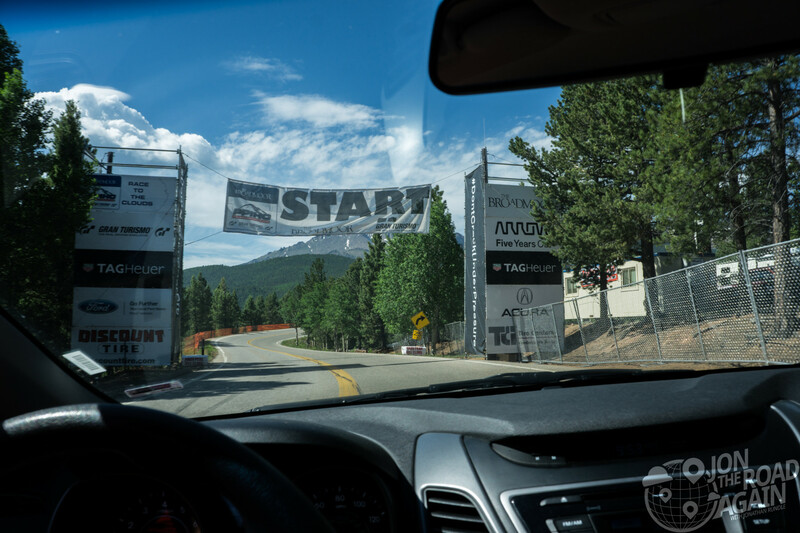 When you get to drive through the starting gate while they finish setting up the Pikes Peak Hill Climb, it makes the visit to Pikes Peak Highway a little extra special. Tomorrow they’ll close the hill for the big race, so today we’re going to put our rental Hyundai Accent through its paces. Maybe we can get a sub-10 minute run. The first car ever up Pikes Peak was W.W. “Cockeyed” Brown’s car, which he called “The Bear Cat.” The year was 1913 and it took him 5 hours 28 minutes. The highway was just a dirt trail at that point in time. Today, the road has been fully paved. Why? Well, the Sierra Club thought the road sent too much sediment down the hill and into the valley and creek beds below. I think most locals would prefer if the road (and the race) was still dirt and gravel. Dirt or paved, it’s really cool to hit the highway’s turns with all of the hay bales lined up for tomorrow’s race. Being in the driver’s seat for these hairpins was pretty harrowing, but a hell of a lot of fun. Most of the road is guardrail-free and a sheer drop, so try not to get distracted by the views. 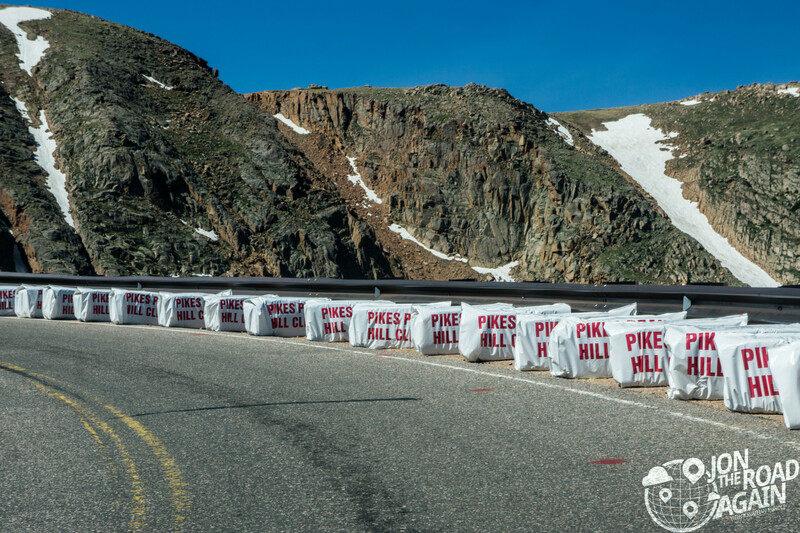 At 14,110 feet, Pikes Peak Highway reaches the summit. 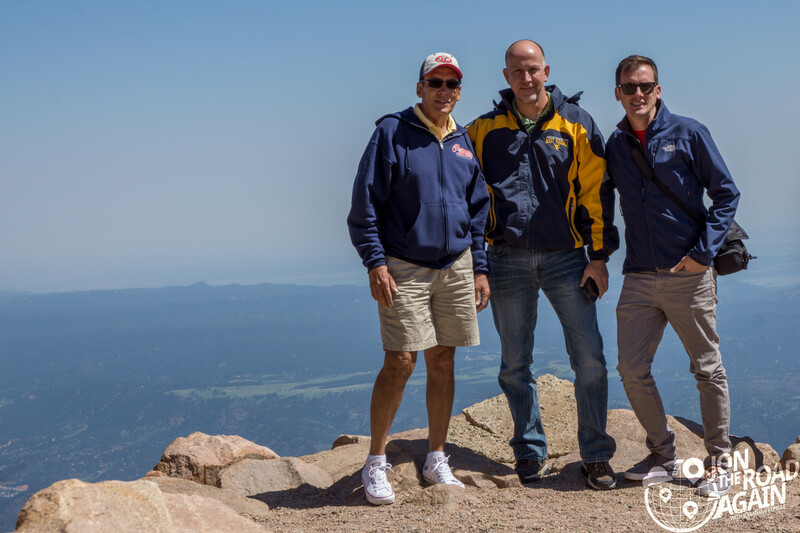 Pikes Peak is just one of 53 Colorado “fourteeners,” which are mountains over 14,000 ft.
Once at the top, as you might expect, amazing 360 degree views were on display. First things first, we posed for a photo with the summit sign. 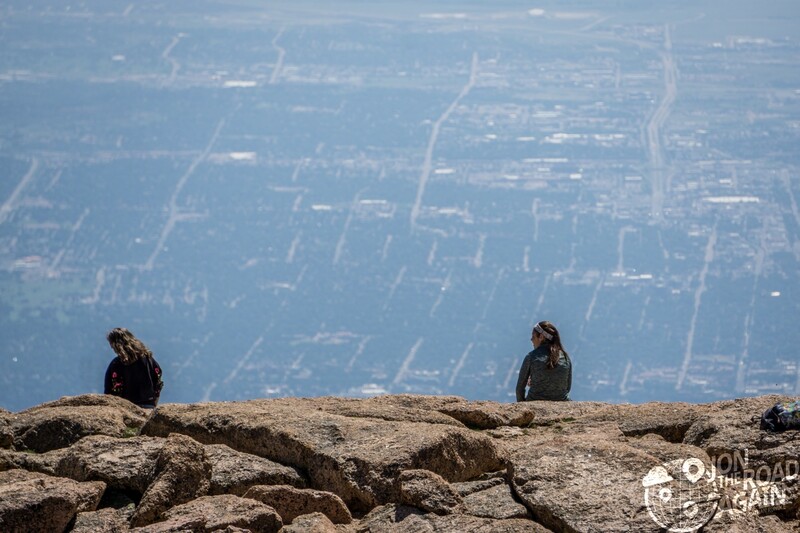 The summit is open for hiking, in fact you can hike to the top if you’re up for it. The Barr Trail is a 26 mile round-trip with a vertical gain of 7,400 feet. They say you can do it in a day, but you could also camp or rent the Barr Cabins halfway through. Be wary of lightning, it’s a killer on the route. The only hiking we did today was to get a better viewpoint or a better background for our photo. It is said on a perfectly clear day you can see all the way to Kansas from up here. A couple of oddities are on or around the summit. The first you’ll see is a huge plaque commemorating the writer of “America the Beautiful” by Katherine Lee Bates. Apparently she wrote the song after being inspired by her visit to the summit in 1893. 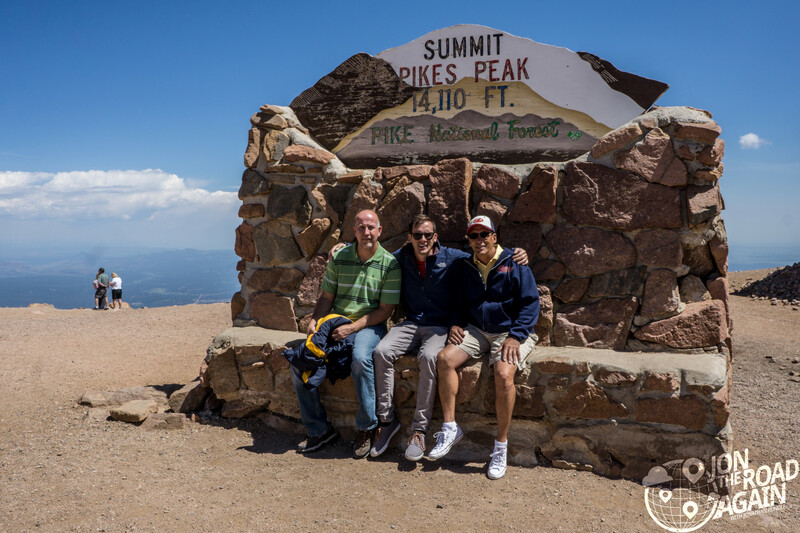 Another is a plaque to Zebulon Pike, the US Army officer and explorer who was the first American to see Pikes Peak. He didn’t summit as a result of weather, but his travel chronicles captivated the nation. Finally, there is a Freemason time capsule drilled into one of the rocks. It speaks of “The Craft” and some other nonsense. It will be opened again in 2099. 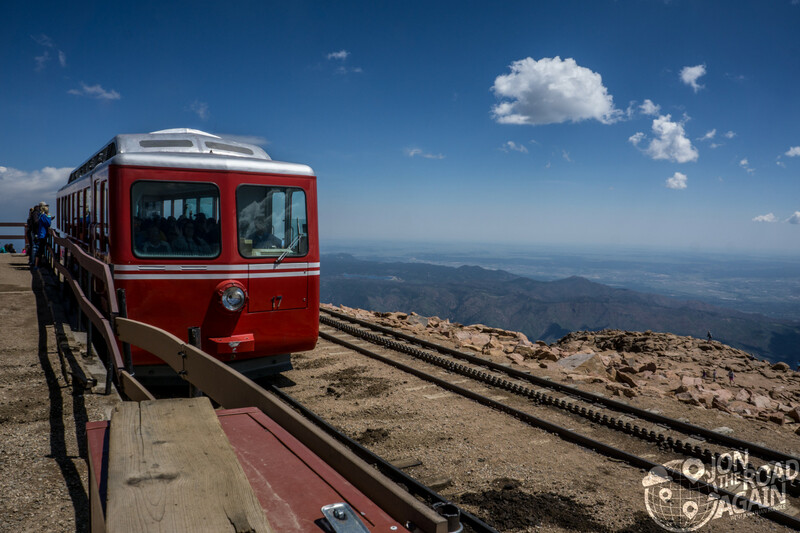 In addition to driving and hiking, there’s another way up the mountain – the cog railway. 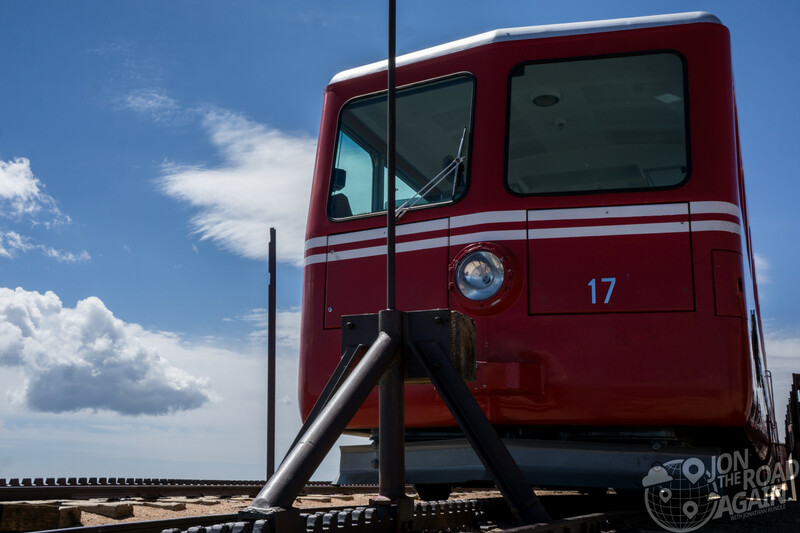 Built exclusively for tourist use back in the 1890s, the railway is the highest railroad in North America. Up to 8 trains run per day, and the cost is $38 for adults, $20 for kids. Ah, one last photo from the top. Time to head back down the mountain. You’re advised to use a low gear since the grade is steep and relentless. There is a manned brake check station at the halfway picnic grounds where they’ll see how hot your brakes are running with an IR temperature gauge. America’s Mountain has varied operating hours, depending on the season. Be sure to check their official website for the latest times and admission fees.